Amish entrepreneurs often do have this sort of funny business posted on the walls of their businesses. I think I’ve seen all of these (or variations) except the battery/charge one. Can’t beat that EZ Credit Plan! Those are funny! They copied that one about the husband calling, from what most say” Your wife called. Having something like that in the store to bring a smile to a customers face, probably brings in more business as well! Wish more of the english business’s had something like this posted, would make everyone’s day. I like those – I should put those on my web site! My favorite is the “Bad–tell us; Good–tell others” message. They’re right, nothing beats word of mouth referrals! 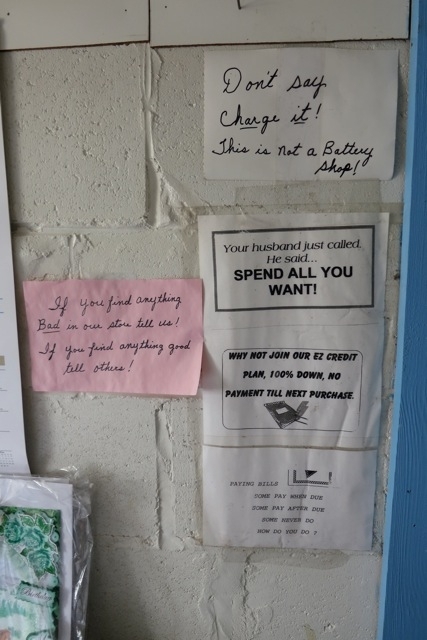 One thing I like about these signs–which, again, are typical in a lot of Amish shops–is how “in your face” they are–the things people might want to say from time to time but propriety as an Amish person or business owner dictating that you do not. it, I PAY TAXES on it. Now, how can you ask me to take any less? first time I’ve seen this message on one! You need to share this on the internet with others. Specifically thinking of The Nate Berkus Show and a couple of his guest host salvage shoppers who always say “politely ask if the dealer can do any better on the price.” I think they’d get a kick out of seeing from the seller’s perspective. Do Amish follow child labor laws?